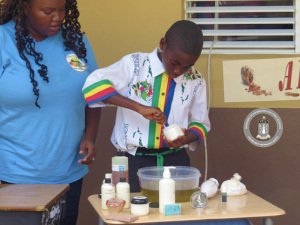 As part of activities to celebrate Culture Week 2014, students, teachers and visitors to the Robinson O’Neal Memorial Primary School got a first-hand experience on how to make lemon-grass lotion earlier today. Nature’s All Natural representative, Mrs. Asheina Blyden demonstrated the production process of the lotion with the help of students. She used ingredients including lemon grass infused in a mixture of oils, candle wax, shea butter and neem. Students were involved in other activities including, plaiting ‘wist’ to make a fish-pot, dancing the two-step, observing fish and Johnny cakes being fried on an outside coal pot, and sampling bush tea and pea soup. Representatives from Money Matters BVI were also on hand to inform the students on the importance of saving. Meanwhile, Director of Culture Mrs. Luce Hodge Smith shared her excitement with the student body. She thanked the principal and her staff for their support in keeping the Virgin Islands culture alive and for their involvement in this week of activities. The students presented a cultural programme which was well supported by the seniors in the community. As part of the programme, students rendered songs, delivered a poem and a dance. Local band Leon and the Hot Shots provided live entertainment. The Elmore Stoutt High School will host their cultural programme tomorrow November 13. As part of their activities, 15 cultural stalwarts in the community and past Ministers of Education and Culture will be honoured. Other schools to hold activities tomorrow include the Eslyn Henley Richiez Learning Centre, the Althea Scatliffe, Francis Lettsome, Ebenezer Thomas, Ivan Dawson and the Leonora Delville Primary Schools. The week culminates with a Cultural Parade to be held on Friday, November 14 at 10:30 a.m. The parade begins from the 1780 Lower Estate Sugar Works Museum and will end at the Noel Lloyd Positive Action Movement Park where a Taste of the BVI Cultural Food Fair will be held in conjunction with the BVI Tourist Board. Residents are asked to wear their Territorial Wear.